A design tribute to Bulova’s acclaimed ‘70’s Oceanographer diver watch powered by a fine Swiss self-winding 26-jewel mechanical movement. Limited edition of 666 individually numbered pieces. 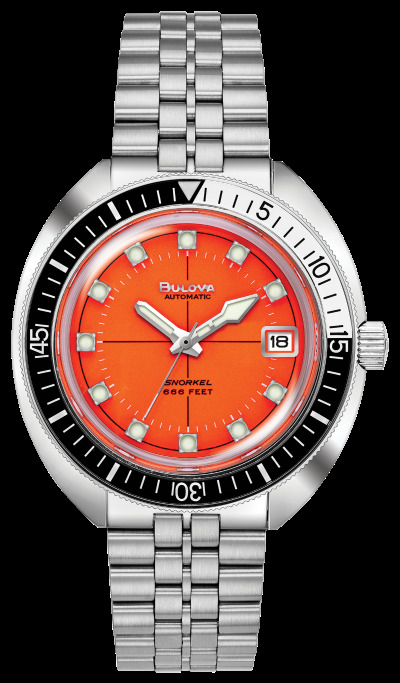 Stainless steel screw-back case with screw-down crown, black/white unidirectional bezel, orange three-hand dial with luminescent markers and date feature, box sapphire crystal with blue anti-reflective coating, stainless steel bracelet with fold-over buckle closure, safety bar and extender, and water resistance to 200 meters/666 feet. Presented in special packaging with special limited edition insert card. Swiss made.